Detailed instructions how to reproduce the bug. These should allow someone who is not familiar with the affected package to reproduce the bug and verify that the updated package fixes the problem. Please mark this with a line "TEST CASE:": on KVM/qemu with /dev/vda only try running "dpkg-reconfigure grub-pc" the scripts in that package will fail because /dev/disk/by-id does not exist due to missing udev rules. A discussion of the regression potential of the patch and how users could get inadvertently affected. : only two additional lines of udev rules and only affects /dev/vd* devices. The grub-pc.postinst script fails to detect virtio "vda" disk in a KVM guest because it looks for entries in /dev/disk/by-id/* and there is absolutely no /dev/disk/by-id directory at all when the only disk is a vda virtio one. You can test this either by creating a new KVM VM guest running Ubuntu 10.04 with only virtio vda disk or by converting an existing hda disk VM guest into a vda one and then trying to purge and re-install grub-pc. If the KVM VM guest running Ubuntu 10.04 is configured to boot from LVM this issue is not seen; the failure requires a guest with a bare /dev/vda disk. Applying the patch (attached) to grub-pc.postinst in the KVM VM guest allows you to install (or re-install) grub-pc; without it the grub-pc package will not configure. I would like to fix this somehow, although it seems to me that it's also a udev bug that it doesn't provide by-id links for virtio disks. However, using by-uuid is definitely wrong; by-uuid links only identify filesystems, and the most important entries in this context are those for the top-level disk device which does not typically contain a filesystem. The patch I provided here is not meant for production use; it merely illustrates the bug. The same situation for xen guests. No by-id things, just by-label, by-path and by-uuid. As written in https://bugs.launchpad.net/ubuntu/+bug/524434 I had the same problem with an virtualized Ubuntu 10.04 under XenServer 5.6: The grub installer does not find the virtual hard disks /dev/xvdX. Same here - switched a few kvm guests from ide -> virtio disks. Ran apt-get upgrade and voila, broken packaging system. The patch provided by nutznboltz up there solved the issue. Has this bug been addressed yet ??? We run 3 XenServers and we strictly run Ubuntu for the Linux side quests. I just tried to upgrade one of our name servers today and caught this bug. We have 39 active quests running Ubuntu.. This could prove to be problematic unless it has been patched and apt-get update just is not catching installing the patched version. My current work-around for this is to build the KVM guest using grub2 and LVM encapsulation. For some reason grub2 has no issues installing when using that configuration. 5. Configure LVM to have a single vg (vg0) with one swap LV and one root filesystem LV. One more thing: in order to boot from LVM you must use the linux-server kernel package as the linux-virtual one lacks an initrd with LVM modules. ...not applying this to any machine, for obvious reasons but would like to see this option in /etc/default/grub for reasons which should be obvious. The diffs are simple two-liners. @Mark It is very important to realize that you can't submit bugs or comments in any arbitrary format to launchpad and expect them to be recognized. Take some time to learn how launchpad works as input which is not very precisely formatted gets ignored. @Mark if you really want to submit a real patch, learn how to validate that the change is upstream and how to generate a debdiff and attach it here. Appears there are four different udev disk directories not three. If you have only virtio disk (/dev/vda) plus a disk label you will have /dev/disk/by-label and that is good enough for grub-pc wrt. installing/updating. If you have only virtio disk (/dev/vda) then you will not have /dev/disk/by-id unless you have an LVM vg. Looking at it closer I don't think /dev/disk/by-label makes a difference. It is as if there are at least four committees: grub2, kvm/virtio, udev and Canonical who need to have a meeting to discuss this. /dev/disk/by-id is created by udev rules. This is really a udev bug. This is really a udev bug that was fixed (at least) in Natty. 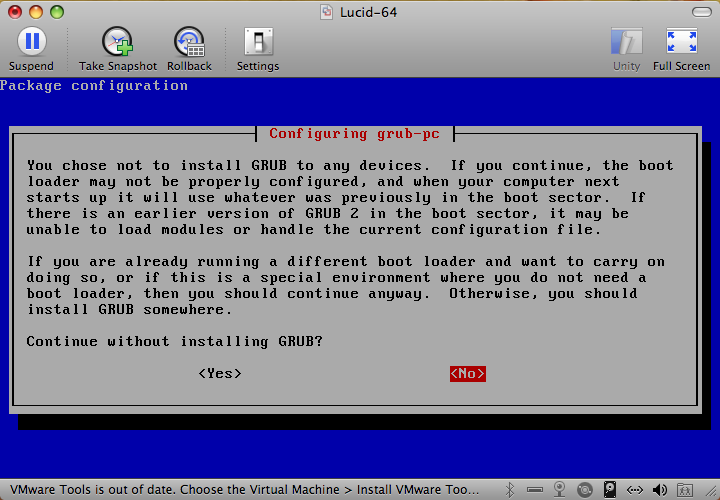 ``You chose not to install GRUB to any devices. If you continue, the boot loader may not be properly configured, and when your computer next starts up it will use whatever was previously in the boot sector. If there is an earlier version of GRUB 2 in the boot sector, it may be unable to load modules or handle the current configuration file. If you are already running a different boot loader and want to carry on doing so, or if this is a special environment where you do not need a boot loader, then you should continue anyway. Otherwise, you should install GRUB somewhere. Then the bug this ticket (LP: #604335) is about is present. Plus when you run "sudo dpkg-reconfigure grub-pc" you see /dev/vda and /dev/vda1 offered as targets for installing grub2 into and do not get the above error messages then you do not have the bug. This requires modifying the kernel. The refusal to SRU the original ("grub-pc.postinst.udiff") patch means that kernel changes and udev changes are needed for a bug that was fixed in 10.10. A peek inside the bash script in that package named /usr/bin/grub-installer shows it just has code to match "/dev/[hsv]d[a-z]". Patch attachment is a debdiff against the latest proposed grub2-pc package plus the postinstall script hack. I'm not done working on the patch but it's better to have this than to only have an LTS with a broken grub-pc package in "uF" state. With that PPA you can run "sudo dpkg-reconfigure grub-pc" on virtio block disk but you get a warning message about swap partitions (e.g. /dev/vda1). You can click "Yes" to continue past it and the package status is still "ii" not "uF" or anything indicating configuration failed. That file should contain a serial number but it doesn't. Follow up message has the quote "The qemu on the host isn't new enough to handle the request." Re: qemu newness. VIRTIO_BLK_T_GET_ID only appears twice inside the kernel and one of the times is the #define. So in order to SRU you will need to SRU linux (kernel) virtio_blk.c changes, udev changes and qemu changes. passing a serial/id string to a virtio-blk guest driver. a /sys interface for retrieval of the id from guest userland. /sys/block/vda/serial should not be an empty file. virt-manager 0.8.7 (on 11.10) does not support virtio block serial numbers. If you even provide a serial number virt-manger will not start the VM guest. Only Natty and Oneiric are working and only with the caveat that qemu must be invoked with options to set the serial number of the virtio block devices. Lucid will never be fixed correctly. The amount of changes are too huge. I went back to working on script. New version of PPA with script hack has been uploaded plus new debdiff attached. Could 1.98-1ubuntu12.1~ppa2 be absolutely flawless? 1.98-1ubuntu12.1~ppa4 is more through about insisting on using /dev/vda devices. The previous versions would only try if /dev/by-id was completely missing; this one looks for all the /dev/vd* devices it can find. I was told that SCSI serial numbers are an optional feature. Is grub-pc designed to require an optional feature?